Adapts two RCA plugs to a single 3.5mm stereo plug. Adapts 3.5mm stereo plug to two RCA jacks. Ideal when you want to connect a portable device to your home stereo or when you want to adapt your home stereo to 3.5mm record input on computer sound card or portable devices. This coupler is ideal for connecting two existing 3.5mm audio cables together. • Please note: Adapter does not produce stereo sound. 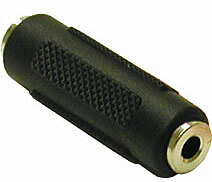 This adapter is ideal for adapting a 3.5mm stereo plug to 3.5mm mono plug. This adapter is ideal for converting a RCA plug to 3.5mm mono plug.